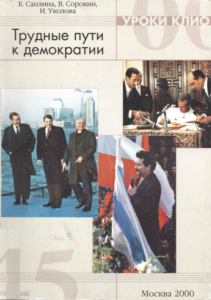 In the context of the “Uroki Klio” project, three textbooks (The Last Decade, Illusions and Disappointments, Difficult Path to Democracy) and one teacher guide (Methodical Guide) were published. The produced textbooks would like to provoke the debate on history education and will assist history teachers in Russia to meet the new requirements. This textbook, entitled "Difficult Path to Democracy," will help educators to teach new content and offer new approaches for the learning and teaching of history. After the changes, Russia had to rediscover the past. Academic historians are reinterpreting the Russian history, but their interpretations are regularly changing due to their political point of view. It will take some time before the Russian historians will have the academic distance necessary for an objective as possible approach in their quest for the historical truth. To provoke a change in the system of history education is a long-term project, which demands for long-term approaches. And a change in ways of thinking makes changes like this. To guide this process of change, or at least a trajectory of it, this project was developed.